Astonishing flexibility to build the site of your dreams. Compose modules in flexible blocks, rows, and columns to create any layout imaginable. Focus on what you want to edit using our front-end visual builder to tweak any page layout while you view it. Showing off your images has never been easier. ProPhoto leverages the latest web technologies to serve your images fast and sharp to all devices, and our responsive galleries look great on any screen size, while offering tons of flexibility. Intuitive front-end visual builder tools allow you to find and edit exactly what you want. Hover your mouse and click in any layout. Plus, tools for customizing responsive appearance and behavior. 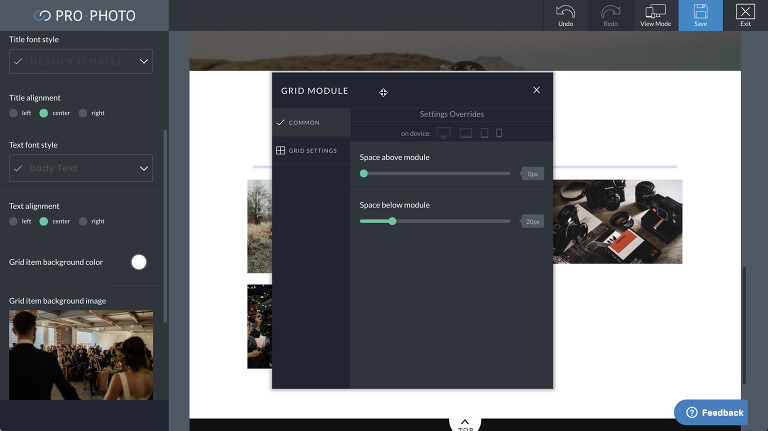 Easily create and customize gorgeous grids to show of your images and link to content. Masonry or cropped, with text below or rollover effects. 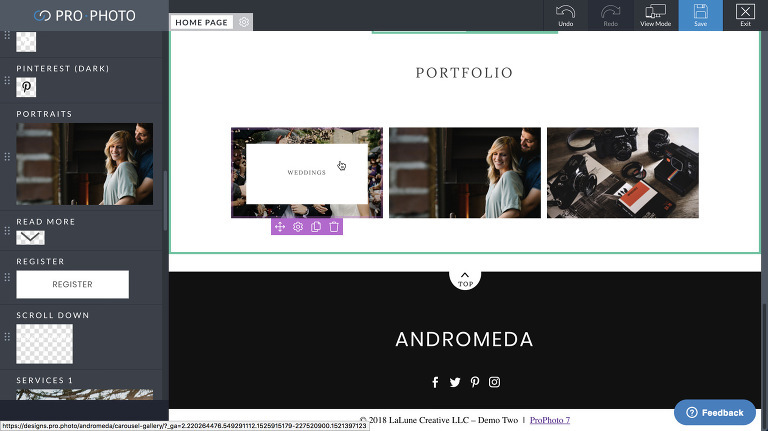 Use grids in blog posts, web pages, or in any layout such as a custom portfolio display. ProPhoto layouts allow you to copy and make variations of your design that you can apply to different pages of your site. Layouts provide an unparalleled level of control, allowing you to fine-tune every aspect of your viewer's browsing experience. ProPhoto is 100% responsive, which means everything you build with ProPhoto will automatically adapt to look great on any device -- phone, tablet or desktop. And, if you want to fine-tune how your site appears at different screen sizes, we've got you covered there too. ProPhoto "Tiles" will blow your mind. They allow you to create and edit responsive graphics with images, text, layers, animation and hover states, all with a drag and click admin UI. The possibilities and applications are endless! ProPhoto has loads of social media integrations built in to keep you connected to your clients and fans. Integrate with Facebook, Twitter, Instagram, Pinterest, and more with just a few clicks. 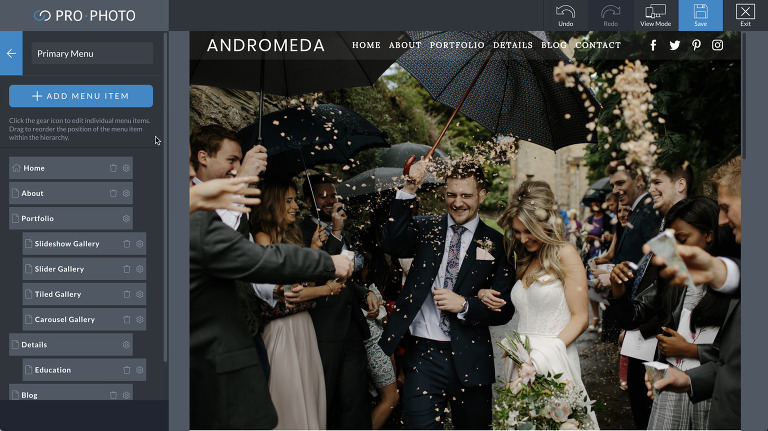 Style your site with great typography using ProPhoto's built in controls. Create reusable, editable font styles that you can apply across various parts of your site. Choose from hundreds of free Google fonts, or upload your own custom font files. ProPhoto comes free with a powerful form builder functionality. 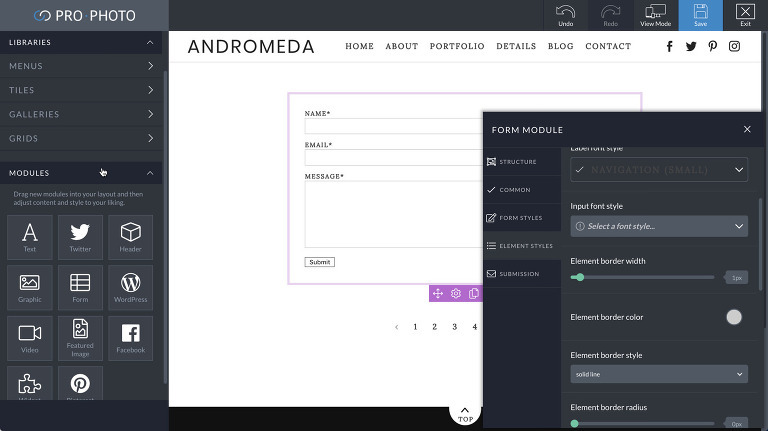 Create as many custom forms as you want, embedding them in blog posts, web pages, or modules. 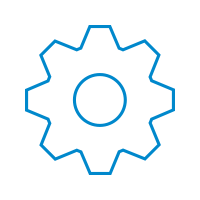 Assign custom email delivery addresses, custom email formats, and set up success/failure pages to dial in your customer engagement. So much power sometimes means you want to experiment in private. ProPhoto has got you covered. Serve one ProPhoto design to your site viewers while you privately test and prepare modifications to your site. Nobody will see until you go live with your new design. 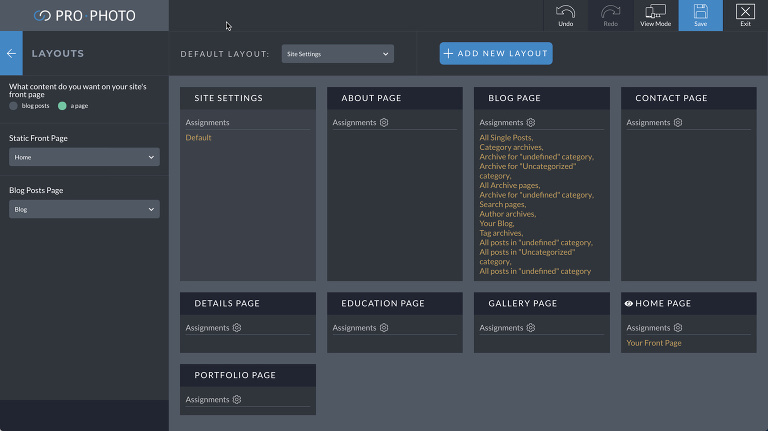 With a drag and drop menu builder, you can reuse links to create as many navigation menus as you need. Place menus anywhere in your page and control when they are seen. Plus a slide-over menu pane is a space saver on small screen sizes. 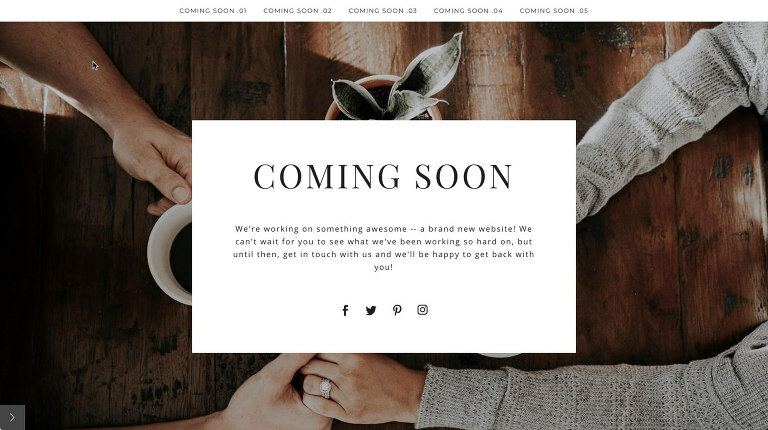 Already using WordPress and a different theme or an older version of ProPhoto? 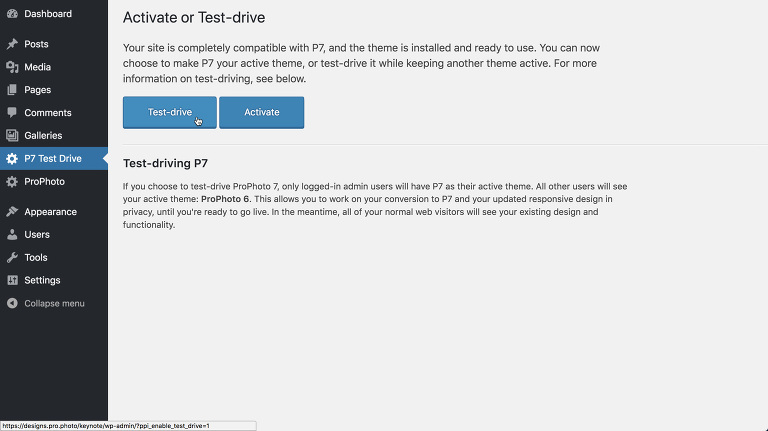 We've made switching easy with a free test-drive plugin which allows you to keep a different theme live for visitors. You can work privately with ProPhoto to launch your new design on your schedule. ProPhoto awesomeness doesn't end when you purchase. Our dedicated team of developers continues to provide patches and updates long after we launch each version. New features, extra designs, and small improvements are the norm for the current version of ProPhoto as the automatic update feature takes care of keeping you up-to-date. SEEN ENOUGH? WHY NOT GET STARTED TODAY? Looking for even more? It's almost ridiculous to try to list all the things ProPhoto can do, but below you'll find a longer sampling of all the stuff you get with ProPhoto. Just click and drag to create blocks, rows, columns, and modules in any arrangement you can dream of. The ProPhoto visual builder gives you infinite possibilities to create exactly the page layouts you want - right on the front-end while viewing your page. ProPhoto tiles allow you to create layered, animated graphic chunks to use as buttons, links and more. Just add text, images, shapes, and animation with our click and drag tile builder tool. Use any arrangement for your navigation menus: horizontal, vertical, collapsing, and mobile with our drag and drop menu builder. Choose from several types of menu items, and reuse menu links and structures throughout your page layouts. 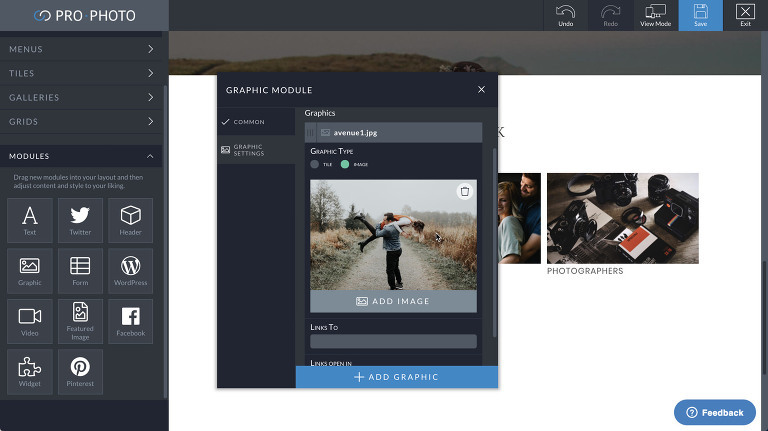 Tons of options for embedding and linking to posts, images, Instragram feeds, galleries and more, are made possible by ProPhoto Grids. 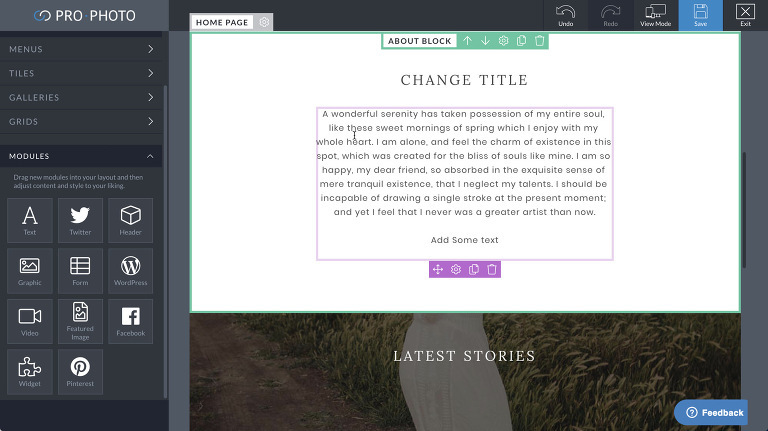 Customize layout and appearance, and embed them wherever you like throughout your site. Any portion of your site can be made "sticky" so it always stays stuck to the top of your site, even when scrolling. If the sticky block isn't your first item, it will stick to the top as soon it reaches the top while scrolling down your page. No need to learn HTML or any other code. 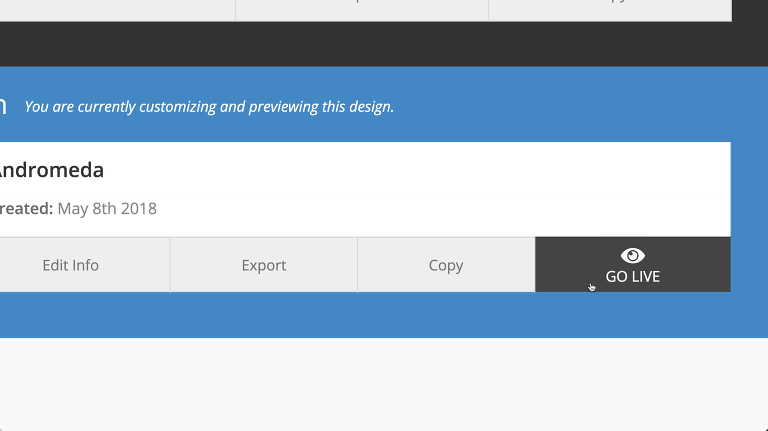 Just drag and drop, slide sliders, and make simple click choices in our visual builder. Watch your vision for your website turn into reality. We handle the complicated stuff so you don't have to. ProPhoto automatically handles making every element of your site responsive, but if you want to dial in exactly how your site looks and feels on different devices, you have options to customize appearance or show/hide at specific screen sizes. Replace the WordPress comments feature with an integrated Facebook Comments tool and visitors will be able to leave their thoughts with their Facebook account. Their interaction also appears in their activity feed for others to see on Facebook. Display the most recent images from an Instagram account in an attractive and responsive thumbnail grid format anywhere in your layout. Each thumbnail links to the Instagram post, too. A built-in Twitter menu dropdown type and recent tweets module gives you built-in flexibility to seamlessly integrate Twitter feed. Create and customize a Facebook Page module with just a few clicks of your mouse to help drive traffic and likes to your Facebook business page. A flexible Pinterest module helps you to drive traffic to your Pinterest profile, or allows your site viewers to easily save any image from your page their boards. ProPhoto follows WordPress best-practices to work great with a huge variety of third-party plugins so you can add other functionality to your website for things like newsletter popups, booking calendars, and lots more. Create gorgeous carousel-style galleries with numerous customization options and fine-grained responsive controls. Create slider photo galleries with customizable controls, navigation, thumbnails, even combine your slider galleries with slideshow mode or fullscreen view! Add image theft protection with a single click. Prevent right-click downloading, and disable default WordPress linking to original files. It's all built in. Automatically apply a watermark of your choice to the images you display on your site for extra theft protection and branding. Your big, beautiful photos will look great on a large high-density monitor, but ProPhoto also optimizes your photos with downsized copies which load fast on smaller screens. All handled automatically from your single image upload. 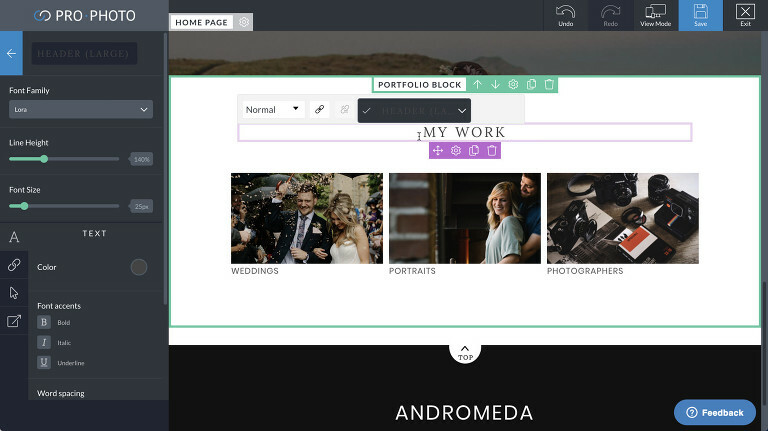 ProPhoto leverages the modern web fullscreen API to display your galleries in a gorgeous, immersive, full-screen mode. Browsers that don't support full screen will use a full-window fallback, which looks great. ProPhoto improves your page speed by loading images on-demand. Image lazyloading will dynamically pull in photos as your visitor scrolls down the page or as a gallery is viewed to save bandwidth. It's easy to create beautiful parallax-style sections of your site by applying background images statically to sections of a site. The page progressively reveals the image beneath as you scroll. 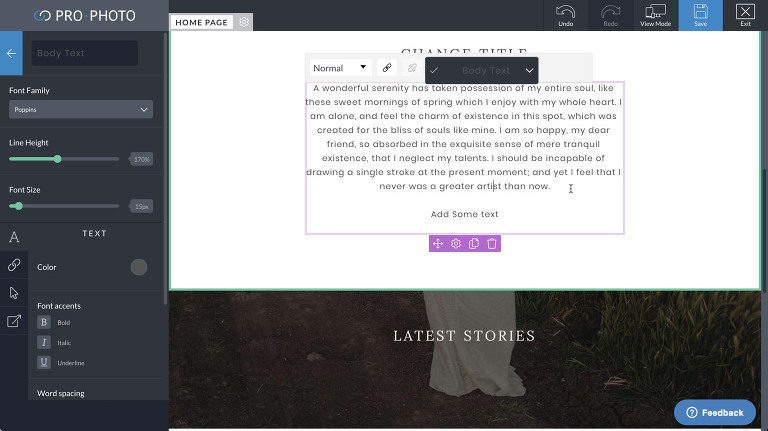 Insert batches of images into posts, pages, or template layouts with thumbnail-style galleries. Thumbnail appearance is totally customizable, and clicking the images can launch a gorgeous full-window or fullscreen immersive experience. Set any ProPhoto gallery to appear as a photo slideshow. Control animation styles, speed, and play/pause buttons so you can show off your images in style. The power of a premium form-building plugin is built into ProPhoto for free. Make as many forms as you like, embed them in modules, post, or pages - complate with custom email notification and success/failure pages. 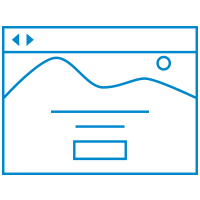 ProPhoto allows you to setup pages for success and failure outcomes for your ProPhoto forms, allowing you to tailor what visitors see after contacting you, and helping you track customer engagement with your forms. Built in scrolling links allow you to guide visitors to different parts of your page with a smooth scrolling animation. Control your site identity by uploading a favicon and iOS homescreen image. Make the entire visitor experience consistent and branded. Built-in support for WordPress threaded comments encourages the most visitor engagement possible with your unique content. Take advantage of WordPress "featured images" to dynamically change an image in your page or post layout. Take control of your branding with easy-to-use typography controls. Create reusable font styles and then apply them to various aspects of your site. Take advantage of Google fonts or upload your own .woff files. 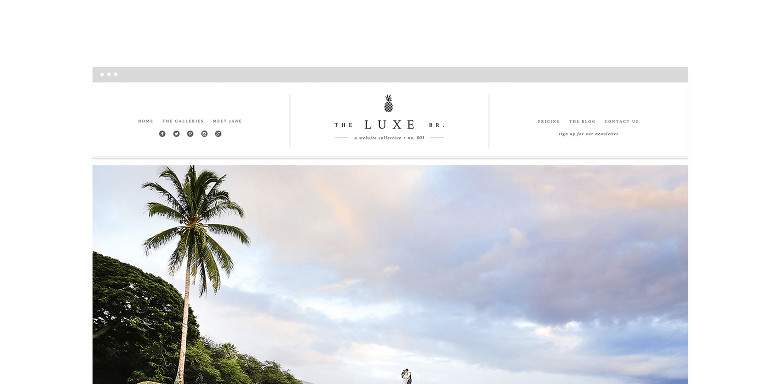 Create a layout using powerful modules built in to ProPhoto, or WordPress default widgets or plugin widgets. Images, grids, galleries, forms, menus, calendars, and lots more. If you have a custom font for your brand, you can upload it in a drag and drop interface within ProPhoto, allowing total control of your typography and branding. You can create any combination of navigation menus you need with ProPhoto's powerful menu builder. 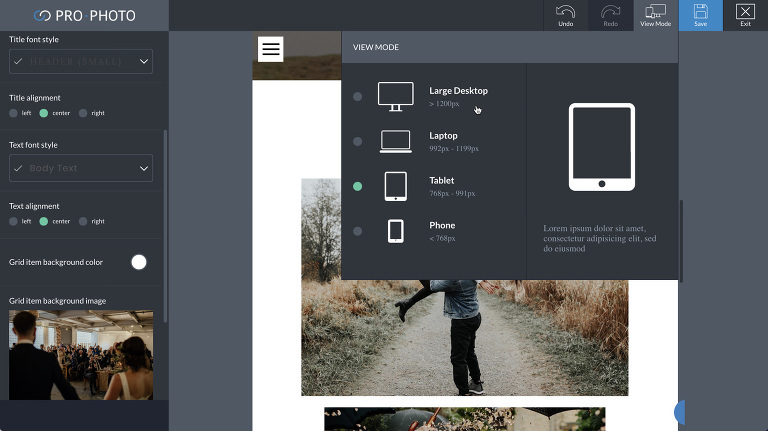 Insert menus as modules in any page layout and control the screen sizes at which they hide and show. 870+ free Google fonts are at your fingertips in ProPhoto. Just type in the font name you want, then select it. No complicated coding or integration, it just works. Create custom grids of thumbnails that link anywhere you want with ProPhoto's flexible custom grids. 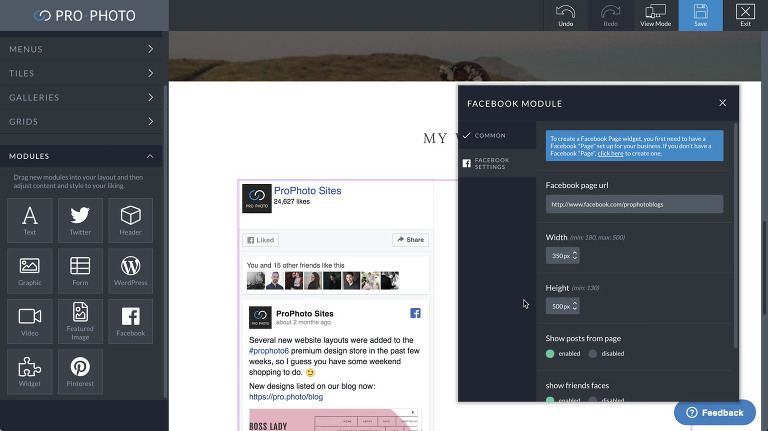 Every layout created with ProPhoto automatically and intelligently reflows and adapts to all screen sizes so your galleries, text, menus, image sizes, and every part of your page layout fit to your visitor's screen. Feature releases and bugfixes are seamless with ProPhoto -- whenever a new version of ProPhoto is ready, your site will automatically update itself with improvements. Built-in support for Google analytics and Statcounter analytics, plus plugin-friendliness for loads more options means you're all set when it comes to integrating the analytics tool of your choice. ProPhoto is under active development. We're always tweaking to add new enhancements, features, and refinements so ProPhoto is constantly improving. ProPhoto has a seamless, built-in page caching option to keep your site running fast no matter what web-host you're on, without the need for complicated caching plugins. ProPhoto is tested and compatible with the very latest versions of PHP, including PHP 7.2 making it easy to stay on the cutting edge of speed and safety. Let's build something great today!